The reverse trigger mechanism adds 2" (5cm) of band stretch to your speargun in comparison with conventional trigger mechanisms. More band stretch means more power & more range, without increasing the length of the speargun. The extra band stretch is due to the shaft engaging the sear at the back end of the trigger mechanism instead of the front end as with conventional trigger mechanisms. Easy to install, just shape the speargun stock under the line release arm for it move freely. Automatic resetting line release. When the spear engages the trigger mechanism the line release arm moves to the locked position. Line release pivot screw is flush with the top of the mech casing. 316 grade stainless steel, 2mm thick casing. 8 mm thick stainless steel sear and trigger. 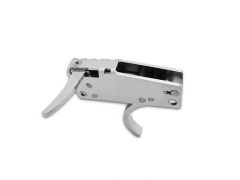 All parts are precision CNC cut, which translates to a smooth trigger pull. 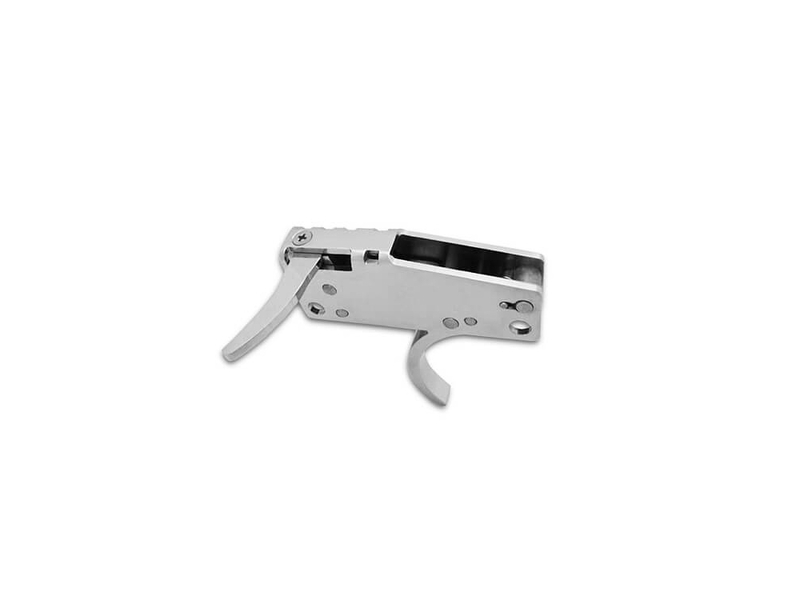 US reverse trigger mechanism can hold a maximum pressure of 1200lbs with a trigger pull of 5.75lb. 1200lbs is equivalent to approximately 12 x 16mm bands. To maintain a safety margin of 50% this mech should be used with a maximum of 6 x 16mm bands. Euro reverse trigger mechanism can hold a maximum pressure of 800lbs with a trigger pull of 5lb. 800lbs is equivalent to approximately 8 x 16mm bands. To maintain a safety margin of 50% this mech should be used with a maximum of 4 x 16mm bands.